Night came and with it a full moon. Puffy gray clouds floated in front of it, darkening the woods. Ian and Mac sat in their tree, hoping it wouldn’t rain. “What? Why do you think that?” Mac looked indignant. “Well, first of all, they don’t always rhyme and there isn’t the same amount of words in each sentence. If it was a real song they’d make sure it sounded right. Come on. Tell me the truth. Are they real songs?” Ian turned to look at the other raccoon. “They are. I’d just suggest if you’re going to sing that you make sure the words rhyme and all that. Now that I’ve gotten that off my chest, I’m ready for my story.” Ian rolled onto his back. “I’d hate that too,” Ian said. “He’d better make up his mind soon or a lion will find him,” Ian said. “That’s right. Off in the distance Earl saw a bunch of elephants. They were walking in a line. No animals tried to eat them. No animals tried to attack them. Earl wanted to be an elephant. 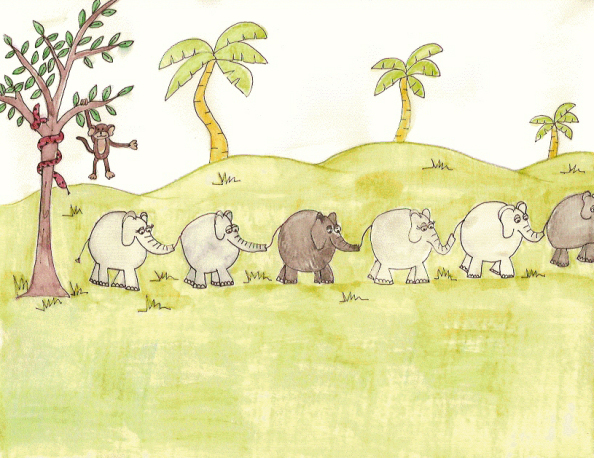 He ran up to the last elephant and was at the end of the line. The elephants marched across the savannah without looking back. There were a lot of mama elephants and their little ones. Earl didn’t see any daddy elephants, just some young boys. When the elephants stopped the one in front of Earl turned around. It ran up to the others and they gathered to talk. They didn’t want a zebra traveling with them. Lions eat zebras and they didn’t want the lions to try to eat their babies, so they chased Earl away. “Earl was sad. He had to look for something else. He saw some giraffes nibbling on the branches of a tree. Earl wanted to be a giraffe. 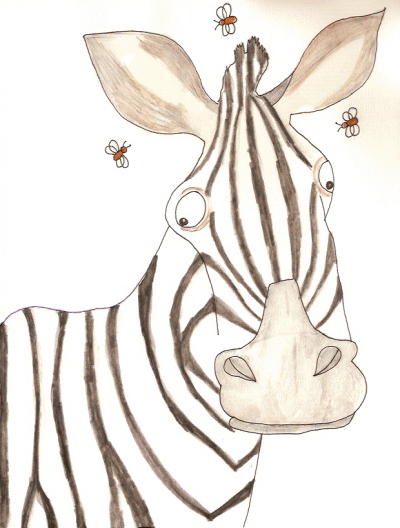 He didn’t have a long neck like a giraffe, or spots, but he did have stripes. He ran over to the tree and tried to eat the leaves. He couldn’t reach them. All he did was grab the branches and they slipped out of his mouth and hit the giraffe’s legs. They didn’t want a zebra hanging around. Lions eat zebras and they didn’t want a lion to come along and try to eat them, so they chased him away. “Is that it? No violence. No action. No song or poem? I’m disappointed; however, I am tired now. That story was so boring that it’s made me sleepy. Goodnight, Mac. I hope your story tomorrow is more exciting than that one.” Ian closed his eyes and fell asleep. Mac stared at the stars. “I can’t win.” He let out a sigh and then went to sleep.